There’s an imposing, sore thumb underway in the heart of suburban Brentwood. A subtle, horizontally meandering ranch (much like the one remaining across the street) went up for sale, and someone bought it to do that trendy Teardown thing. The trouble with Teardowns is precisely described here, and this intersection neatly captures the concept. A mixture of appropriately scaled bungalows, ranches, 1.5-story and 2-story homes get a dose of steroids in the form of a new construction that could be described as…well, Post-Modern Greek Colonial Federal Anti-Lawn Revival. While it’s no taller than the houses directly next door to the west, it does have that bloated, too-much-high-fructose-corn-syrup look common to deep West County McMansion developments. That the new construction is trying to elbow the other houses out of the way is most evident when approaching the house from the back (pictured below). Heading north on High School Rd., first you see a long row of garage doors spring out of a cluster of trees, then 2 gigantic bay windows pop out like Double D’s on Olive Oyl. Mere feet away from the stop sign intersection, and you can literally feel the compression, a massive wall of doors and windows slamming into the street, threatening to bulldoze the bungalow across from it. Every time I drive past, my left shoulder instinctively flinches away to keep from hitting it. I worry that the neighbor’s vegetation might not adapt to having the sun blocked out. Does the rest of the neighborhood find this is a welcome addition? This entry was posted in housing, st. louis county and tagged brentwood infill housing, high school road and lawn ave by Toby Weiss. Bookmark the permalink. I see both of your points. The first poster says basically people want the big houses, and they’d rather have them in Brentwood than in O’Fallon. Joe responds that that’s all fine in good, but they should be respectful to the surrounding environment and not try to crowd the lot with too much square footage that they really don’t need anyway. I agree that some people want the big “McMansion” with its vast open floor plans, gigantic closets and skylit master baths. That’s the rage. That’s what people want to live in. Their friends in O’Fallon get to live like that, why can’t those who would rather stay east of Lindbergh do so too? I think this quandary has more to do with the bloated housing market than any sort of disrespect for environment. I mean, I’m no expert, but have bought and sold houses in the STL area in the last few years, and would guess that the Brentwood behemouth pictured probably will sell for $450K to $600K. Maybe more, but I doubt less. The one that was sacrificed to make room probably would go for just over $300K – ballpark. 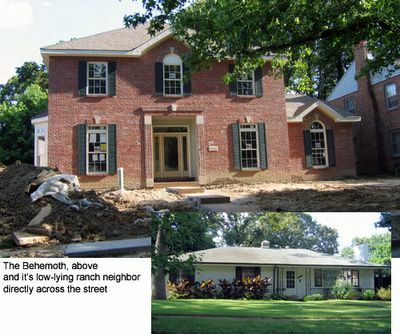 Now, here’s the deal… if the Brentwood McMansion was in O’Fallon, it would probably be somewhere around the price of the sacrificial lamb – $300K or so. Hmmm…. So, if you’ve got say $300K in credit to buy a house, and you want to stay in the inner ring, you’re options are to buy the sacrificial lamb — and then maybe save up to tear it down and rebuild (or build on top/around it — this seems to be popular as well in Kirkwood and Webster) — or move out to O’Fallon. Why can’t people just be content with regular houses that aren’t as bloated as the market? Because, they’re friends in O’Fallon aren’t. And if you know that they’re paying the same amount you did, but getting a brand swanking spanking house, while yours is old, small and has a leaky basement and a moldy kitchen, you might think about a Teardown, too. But if you tear down, make sure what you build up is not so out of place as that McMansion seems to be. For those of us cursed with seeing the big picture all the time, it is a difficult quandary. Do we encourage new building in older neighborhoods or not? If we’re looking at each individual neighborhood in a vacuum, the answer would be, “no, leave ’em alone.” But, we’re not in a vacuum. As sprawl pushes residential development further and further out west and south (and north and east, too, I guess), you have to wonder what, if anything can slow it down. Building new where the old is wearing down does seem to be a good big picture idea. But, why does it have to be so big and bulky. The previous post-er says, “Here’s what you’re not realizing. They want the McMansion.” Well, I think I realize that, but I can’t help but continue to wonder why. As a lover of architecture AND a lover of the environment, I suppose I am wanting to have AND eat my cake, granted. But, I don’t think it’s necessarily a win to get that kind of development disguising itself as a rebirth, when it’s really just more of the same. The wolf came in sheep’s clothing. Bringing O’Fallon-like development to the inner ring… well, what’s the point? Profit is the point. As the post-er suggests, this is what people want. But, why? Because it’s what they’re being sold. The higher the square footage, the higher the price, so put as much square footage on that lot as possible, right? Well, we used to at least ATTEMPT to balance profitability against other aesthetics, but those days are, unfortunately, far, far in the rearview mirror. Please, spare me your lecture. Those “subtle, horizontally meandering” houses in this area are a far cry from historic (as referenced in your CSM link) or even charming ones. They’re milquetoast, practical (and probably currently drastically overpriced) homes built in probably the 60s or 70s that are not all that attractive to potential home buyers, especially those with growing families who would likely become neighborhood fixtures (and contributers) if they had the home that they could live for 20 years in. So, why not build that kind of home to attract those kinds of families? Here’s what you’re not realizing. They want the McMansion. And they already like the area and the location (location! location!) — in this case Brentwood — and would rather have their McMansion in Brentwood than in Chesterflood or (gasp!) O’Fallon. The same goes for the Teardowns in Kirkwood and Webster. So, the existing homes now have a new kid on the block that’s bigger, better looking and more viable for really, let’s face it, the type of neighbors the neighborhood wants. I suppose someone will try to tell me that such neighborhoods don’t need such people, and such people can take their horrendous McMansions elsewhere and leave the unassuming ranches on High School alone. Fiddlesticks. Yeah, you don’t want families – with kids. Instead you want a more mature, kidless citizenship whose health with fail, whose yards will die, whose decks with rot and whose home values will plummet… opening the door for a new breed of tenant. I agree that some teardowns can be absolutely hideous — but others, especially the ones that are aesthetically correct, should be welcomed, not scorned. I think your example here is the latter.